Not to be confused with pasilla. This article is about the chile pepper originating in Puebla, México. For persons from Puebla, called Poblanos in Spanish, see Puebla. 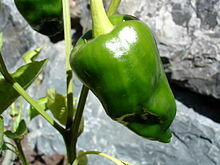 The poblano (Capsicum annuum) is a mild chili pepper originating in the state of Puebla, Mexico. Dried, it is called ancho or chile ancho, from the Spanish word ancho ("wide"). Stuffed fresh and roasted it is popular in chiles rellenos poblanos. While poblanos tend to have a mild flavor, occasionally and unpredictably they can have significant heat. Different peppers from the same plant have been reported to vary substantially in heat intensity. The ripened red poblano is significantly hotter and more flavorful than the less ripe, green poblano. A closely related variety is the mulato, which is darker in color, sweeter in flavor, and softer in texture. The bush has multiple stems and can reach 25 in (0.64 m) in height. The fruit is 3 to 6 in (7.6 to 15.2 cm) long and 2 to 3 in (5.1 to 7.6 cm) wide. An immature poblano is dark purplish green in color, but the mature fruits eventually turn a red so dark as to be nearly black. Poblanos grow in zones 10–12 and do best with a soil pH between 7.0 and 8.5. They typically prefer full sunlight and may require additional support for the growing fruits during harvest in late summer. A poblano takes around 200 days from seed to harvest and requires soil temperatures of at least 64 °F (18 °C) to germinate. Preparation methods include: dried, stuffed, in mole sauces, or coated in whipped egg (capeado) and fried. It is particularly popular during the Mexican independence festivities as part of a dish called chiles en nogada, which incorporates green, white, and red ingredients corresponding to the colors of the Mexican flag. This may be considered one of Mexico's most symbolic dishes by its nationals. It is also usually used in the widely found dish chile relleno. Poblanos are popular in the United States and can be found in grocery stores in the states bordering Mexico and in urban areas. A dried poblano is called a "chile ancho"
^ Lillywhite, Jay M.; Simonsen, Jennifer E.; Uchanski, Mark E. (2013). "Spicy Pepper Consumption and Preferences in the United States". HortTechnology. 23 (6): 868–876. Any pepper type with ≥ 1 SHU could be considered spicy. However, for this study, paprika (0–300 SHU), New Mexico long green or red chile (300–500 SHU), and poblano/ancho (≈1369 SHU) types were included as mild spicy peppers (Table 1). ^ Julius, David; Caterina, Michael J.; Schumacher, Mark A.; Tominaga, Makoto; Rosen, Tobias A.; Levine, Jon D. (1997). "The capsaicin receptor: a heat-activated ion channel in the pain pathway". Nature. 389 (6653): 816–824. doi:10.1038/39807. ISSN 0028-0836. PMID 9349813. Reported pungencies for pepper varieties (in Scoville units) are: Habanero (H), 100,000–300,000; Thai green (T), 50,000–100,000; wax (W), 5,000–10,000; and Poblano verde (P), 1,000–1,500 (ref. 23). ^ Burge, Weldon (1995). Grow the Best Peppers: Storey's Country Wisdom Bulletin A-138. Storey Publishing, LLC. p. 10. ISBN 978-1-60342-277-2. ^ "Ancho: Definition of Ancho in Oxford Dictionary (American English) (US)". Oxford Dictionaries. Oxford University Press. Retrieved 2014-06-29. ancho; Syllabification: an·cho; Pronunciation: /ˈanCHō, ˈän/; (also ancho chili); Noun (plural anchos); A large aromatic variety of chili, used (usually dried) in dishes of Mexican origin or style. Origin from Mexican Spanish (chile) ancho 'wide (chili)'. ^ a b "Growing Poblano Peppers". Archived from the original on 1 November 2012. Retrieved 10 June 2012. ^ "Mulato Pepper: The Ancho's Swarthier Cousin". Pepperscale. November 15, 2014. Retrieved February 23, 2017. This page was last edited on 9 January 2019, at 11:10 (UTC).